Recently, a friend of mine asked me to recommend to her the best social media managing and automation service available. She runs a small agency with about 15 employees and less than 50 clients, whose social media presence and blogs she currently manages. I was nearly done with the pros and cons of Hootsuite and Meet Edgar and wasn’t convinced how to recommend one app over the other. Meet Edgar offers a really nice, clean and clutter free interface. It has also the famous recycled queue functionality that prevents your social media streams from running out of fuel. But on the other hand, it works only with LinkedIn, Facebook and Twitter and doesn’t allow you to interact with your followers directly from within the app. You have still to go to the specific service and reply to a particular user. And Hootsuite, as rich with functionality as it may be, doesn’t have the recycling queue and you have to painstakingly add and schedule every single post! 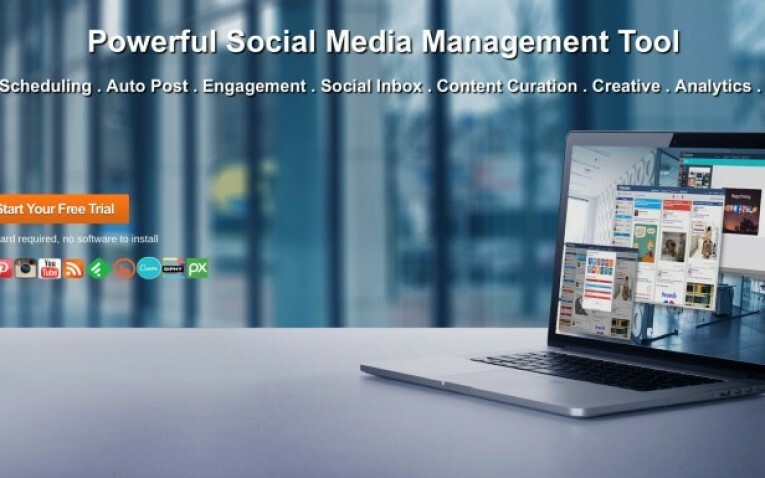 I just had decided to tell my friend to go with both tools, as each one covers specific aspects of social media management and automation when I heard about eClincher. From the point of functionality and value for money, I was really wowed. For less money, it combined everything both of these apps had to offer and more. Not to mention their friendly and professional support team. The user interface looks just a little bit old school and I didn’t quite like it very much, but I think eClincher surpasses both Hootsuite and Meet Edgar in every other aspect by far. 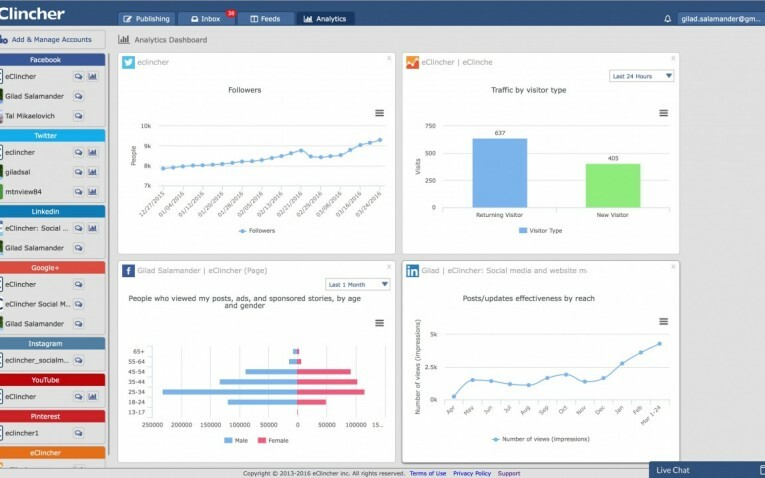 eClincher works with a very wide range of social media and analytics channels. Currently, the list includes Facebook, Twitter, Google+, LinkedIn, Pinterest, Google Analytics, Instagram, Youtube, Blogger, and Feedly. That’s something to show off with. You can easily add any number of these accounts to your eClincher profile and control nearly any aspect of them from one point. As expected, you still can’t post pictures to Instagram. eClincher can’t do anything about it. 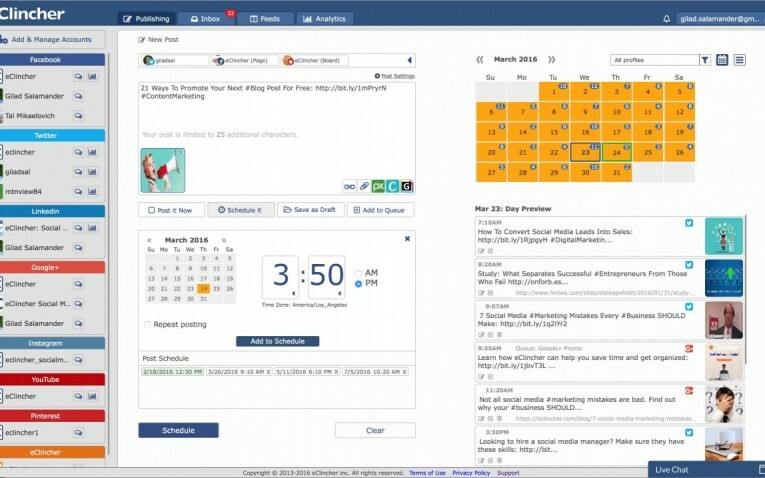 Social media management tools are bound by the functionality each service’s API provides and Instagram has made this its policy from the beginning, not to allow any updates from desktop computers. However, there is a mobile app for eClincher coming soon that, according to the company, will be able to post pictures to Instagram too. 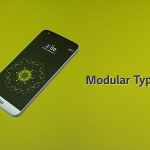 The mobile app is included in all plans. You can create new posts and send them directly to any number of your set up accounts. You can schedule your posts to be sent on a pre-selected date and time. You can create draft posts and save them for future use. You can create queues, and this is a very exciting feature of eClincher. This capability basically enables you to set up eClincher in a way that it recycles and resends a group of your posts to your accounts. Everyone has some evergreen content that needs to be re-posted from time to time. This way you have the ability to increase your visibility and conversion rate, while greatly decreasing the time and effort you spend on social media management. You can specify an end date for each queue or let them run endlessly. This is particularly useful for event related queues, where you like to resend a bunch of posts repeatedly for a definite period of time. Bulk uploading is another great feature of eClincher. You can import content directly from RSS or directly from a CSV file and have it sent to your drafts or a queue. The ability to shorten links. The ability to add images. A nice integration with Pixabay.com, Giphy.com, and Canva.com. You can find images, create and edit images and illustrations, attach it to your social post. You can also search and attach animated gifs. 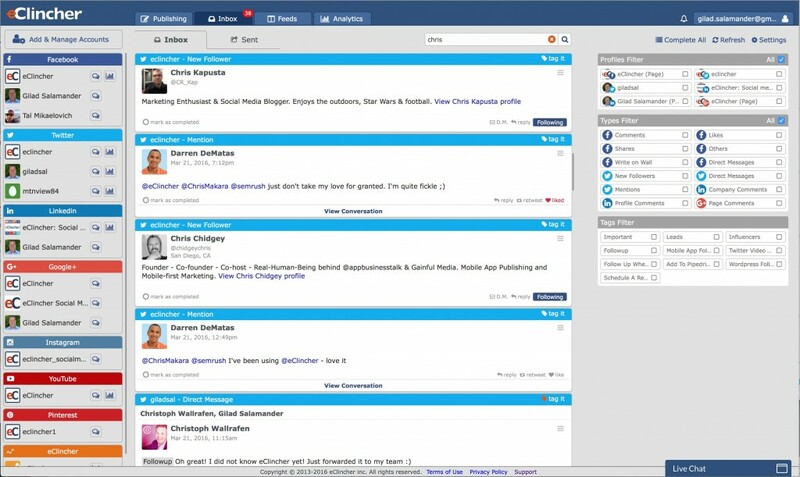 Unlike many other social media management tools, eClincher has a universal inbox where you can check all your incoming messages and notifications. You don’t need to check all your channels individually to make sure you don’t miss an important update. This includes new followers, notifications, comments on your LinkedIn company page, Facebook messages, Google + comments and more. You can also control what type of messages from which account you like to see (or not to see). You can also categorize and tag your messages for later references. The best part: a convenient search box. You don’t need to go through all your social media channels to find a particular message anymore. Unlike Meet Edgar, eClincher enables you to directly engage with your fans, followers and customers from within the application. You can respond to tweets, DM a follower or send a message to a LinkedIn friend. You can also interact with their posts and profiles. One of the main selling points of any social media management and automation tool is its analytics capabilities, and the eClincher ones are amazing. Every social media manager has to prepare periodic reports about at least every social media channel under his/her control. 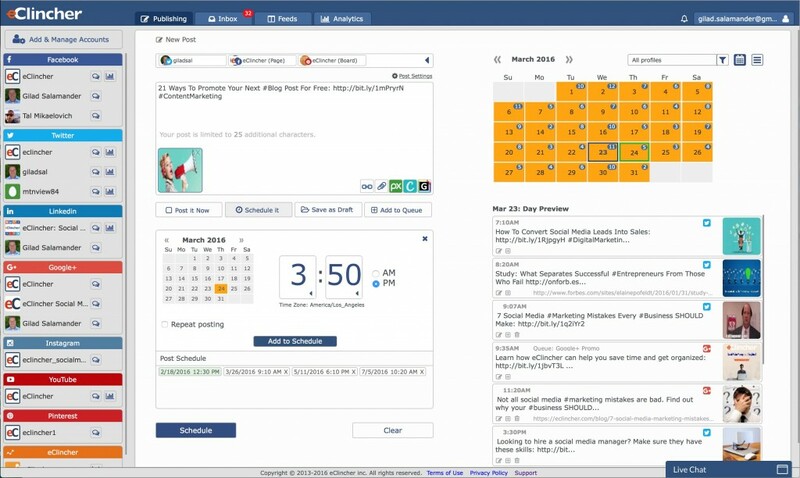 eClincher not only solves this problem and combines all your analytics from different social media channels under one hood, but goes further and incorporates Google Analytics (including real-time traffic), LinkedIn company page analytics, Blogger and YouTube into its analytics dashboard. You don’t have to hunt for different data anymore, but just need to set up your eClincher account. A new feature of eClincher is the capability to find influencers in your niche and network. Influencer marketing is very common these days and eClincher facilitates this very method. 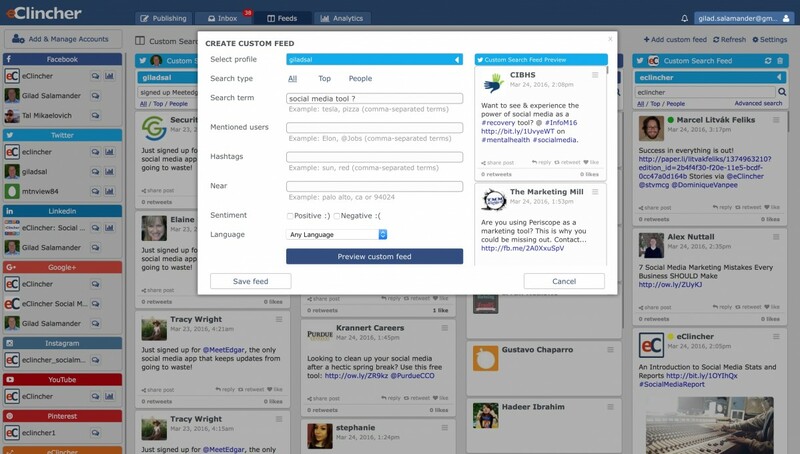 From within eClincher’s interface, you can directly engage people out of a curated list of influencers. If you are looking for new leads and potential customers, or if you are just trying not to miss any customer sentiments about your product, this feature is something you shouldn’t miss. You can set up any number of custom feeds with specific search terms to find and connect with people in need of your products or services. With these feeds, you can easily monitor for trends and competitors and prevent and mitigate any possible customer discontent before it gets out of hand in social media. You just need to set it up with the correct keywords and hashtags. You can also add any RSS feed you find interesting. Here is where eClincher really outshines the competition. With a minimum monthly price of 15 USD, it offers more than most of the competition. For the basic 40 USD per month plan, you get 15 profiles, 15 queues, 3 Google Analytics accounts and more. To tell the truth, I haven’t found a similar tool for these competitive prices. See for yourself (eClincher Pricing). By the way, there is also a free 14 trial period for all the plans and you don’t even need to give your credit card information away. Finally, I would like to talk about the customer support. eClincher acts not only swiftly to general requests for customer support, but listens very carefully to peoples’ needs and request for improvement and features. And these days, you can’t say something like that about a lot of companies (especially established ones). If you’re looking for a tool that is designed with the user in mind then definitely try out eClincher. This social media productivity platform makes the overwhelming process of managing a few to a hundred social media accounts much easier. Social Media Hectic: No More! eClincher is just the all around, one man army and Swiss Knife every social media manager or owner loves. There is simply nothing it cannot do! 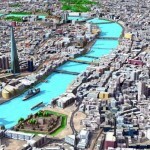 How useful will a 3D Map of the world be in gaming? Fred is a former server admin and web developer. Currently, he is giving advice to different startups and companies about technology trends, solutions and security. I would like to agree! 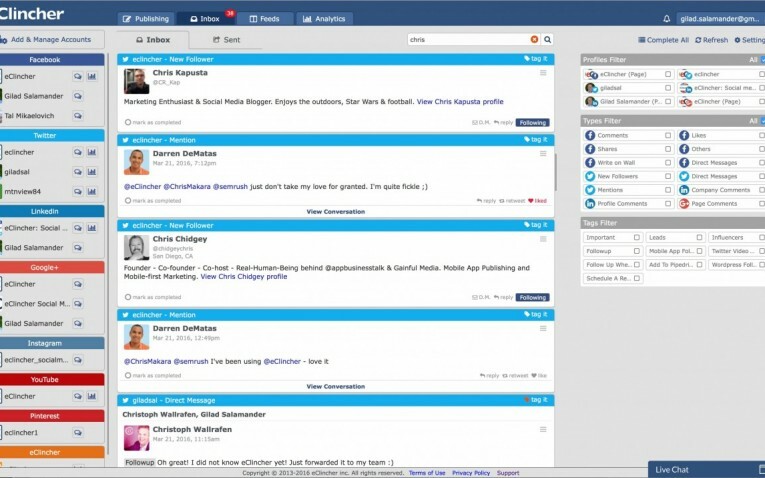 I have been using eclincher for a while now and It has made social media management a breeze! I have 6 different accounts and use the ques to pretty much crush social media with 2 uploads a day for the next 2 months without worrying about a missed post. Great article! We used its trial offer and it’s working fine except mixed feed automated post is not working correctly for LinkedIn.